•A health club offering a private access to Sauna and Jacuzzi. 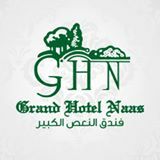 Grand Hotel Naas organizes tours to Beirut as well to all the Lebanese regions. A conference room is available and can be arranged in different styles catering up to 400 seated persons.